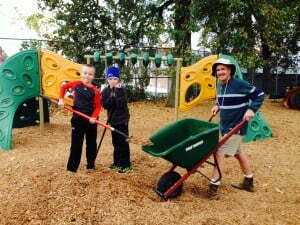 Volunteering and family bonding while spreading wood chips on Cheerful Home’s playgrounds. Since 1886, Cheerful Home Child Care & Early Learning Center has changed many lives in our community through the kindness and generosity of our supporters, staff and board volunteers. They have embraced Cheerful Home’s mission of providing quality child care for all children of the community, with primary emphasis on the care of children of lower income families. They have improved the lives of children by providing a stimulating and nurturing environment for them to grow and learn, with educational curriculum emphasizing skills appropriate to the developmental level of each child. A gift of your time, funds, or supplies can make a big difference in the lives of many children in our community. Cheerful Home is a 501(c)(3) non-profit organization serving up to 181 children ranging from 6 weeks to 12 years of age. The majority of these children are from low income families which greatly benefit from Cheerful Home’s Sliding Fee Scale Program. 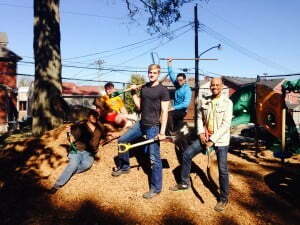 Members of Culver-Stockton College’s Delta Upsilon Fraternity helping spread wood chips on Cheerful Home’s playgrounds. If you would like to make a donation, please contact Cheerful Home by phone at 217-228-0654 or by email at director@cheerfulhome.org. Additionally, monetary donations can be made through our website by clicking on Donate or to our Cheerful Home Children’s Fund Endowment administered through the Community Foundation Serving West Central Illinois & Northeast Missouri. Donated supplies can include new or slightly used children’s clothing, toys, art supplies, books, and so much more. You may have a wealth of donations lying around the house or packed away in the attic that the children would love to have. Just give us a call, and we will put your unused items to good use. Cheerful Home is a 501(c)(3) non-profit organization governed by a Board of Directors, licensed by the Illinois Department of Children and Family Services, accredited by the National Accreditation Commission for Early Care and Education Programs (NAC) and ExceleRate Illinois.